You know the one thing I love about Hunter rain boots? They simply don’t go out of style. Spring, summer, fall, winter, you can wear them year-round without having to think twice! The second thing I love about them? The myriad of color options allows you to cater to any look. A pop of pink for a rainy spring day, classic navy gloss for fall ensembles, and my absolute favorite… red! I snatched up these red beauties in December, and really don’t know why I didn’t own a pair sooner than that! There’s something about them that just puts a smile on my face. I love how the red brings an element of fun and levity to any outfit, like the one I’m wearing today! 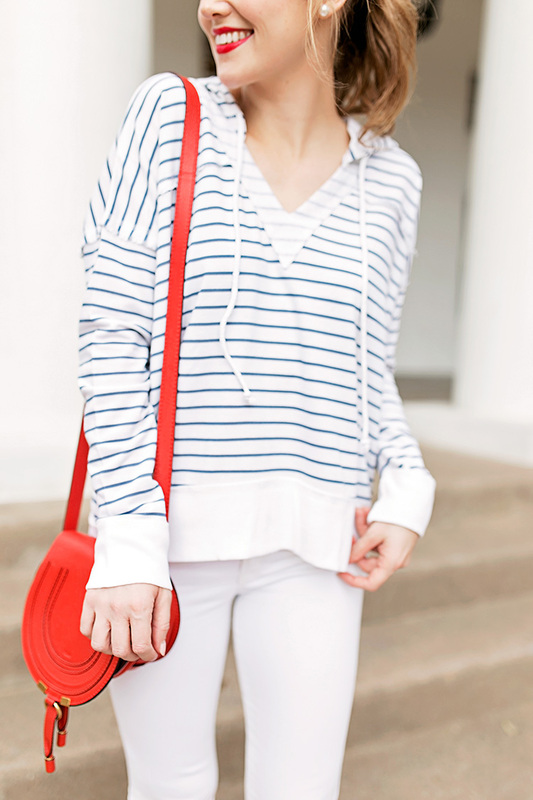 After coming across this incredibly cozy striped pullover, I knew I couldn’t go wrong with a navy and red combination. 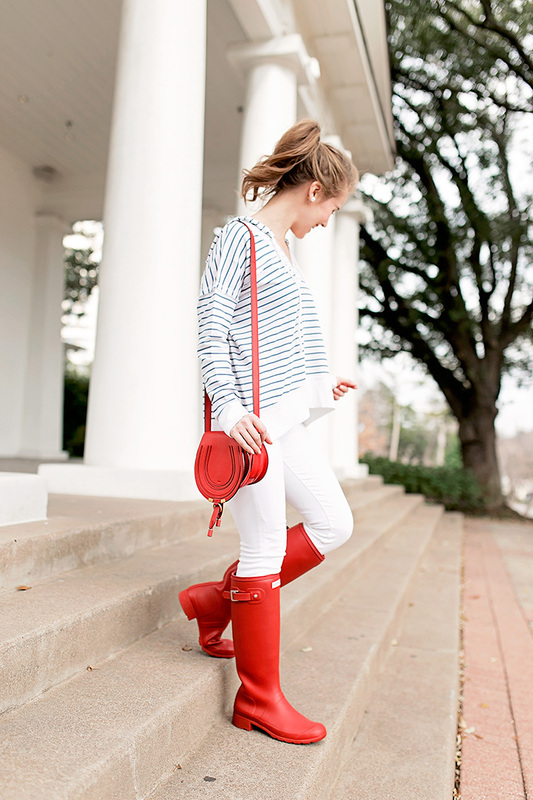 Bright and slightly nautical, this is one look I intend to wear again and again throughout the rainy months of early spring! If you don’t have a pair for spring yet, let me tell you… I can’t recommend them highly enough! Plus, Hunter has tons of cute colors right now. I’m especially smitten with this powder blue, this pink and this succulent green! Word to the wise, the I’ve found the Hunter site has the best selection of colors and sizes, not to mention sale colors! 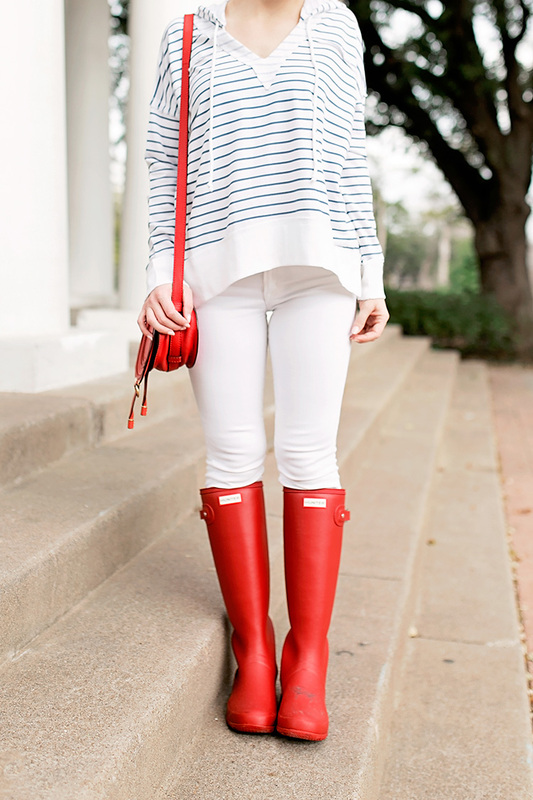 A couple tips about shopping for Hunter boots. When it comes to sizing, size a half-size down if you’re in between sizes. (For example, I normally wear a 7.5 but I wear a 7 in Hunter boots.) Secondly, after you wear your boots for a while you may notice white residue begin to appear! Don’t fret, like I did when I first saw this. A quick Google search informed me that dabbing a little olive oil on a paper towel wipes it away! Does the sweater fit true to size? So cute! So good to know about the olive oil trick, I will definitely be trying that with mine! Thank you!! You’re totally right! Hunter’s are a great year round item. They are just so great! OMG! This look is so amazing! 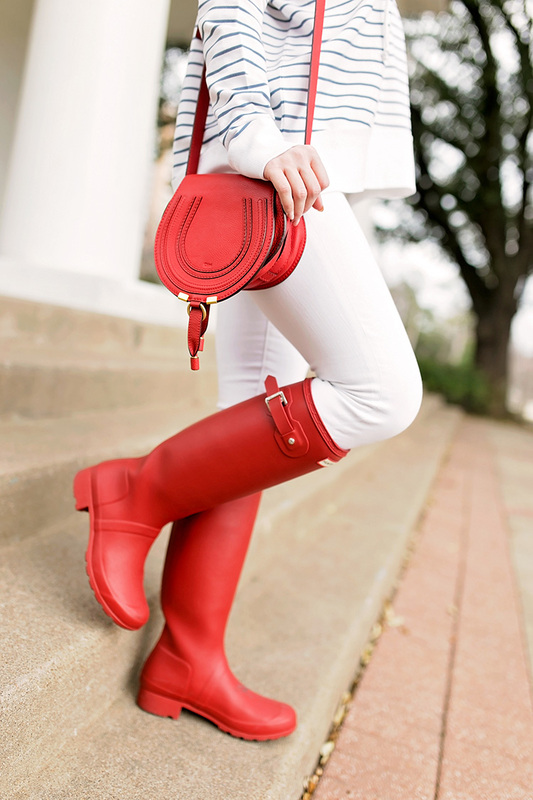 Love the combination of the Chloe bag and the stunning Hunter boots! This look is so cute, Kate- I love your sweater and the pop of red from your boots and bag!